Tapiridus as they are today have been around for 20 to 30 million years, since the Oligocene. The average species on Earth lives around 200,000 years, so tapirs have been very successful. Unfortunately for us in the Pacific Northwest, tapirs migrated from North to South America about 3 million years ago. Tapirs didn’t become extinct in the Northern Hemisphere until about 10,000 years ago. Today tapirs still exist in South America and Malaysia. Malayan tapirs (Tapirus indicus), with their panda-like black and white coloring, are probably the most well known. However, the Brazilian tapir (Tapirus terrestris) is the most populous. In vulnerable status, even these largest mammals in South America could be facing trouble. 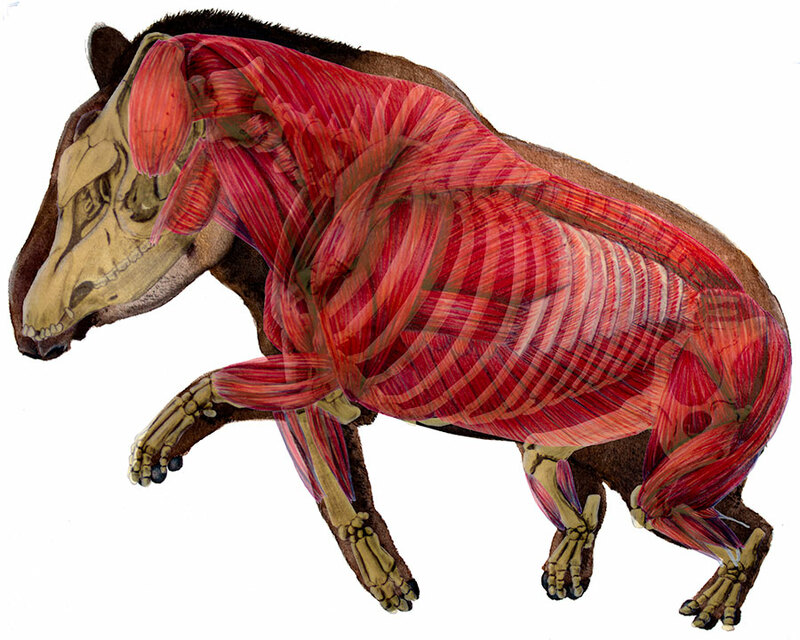 Tapirs have a lot going for them physically, and it must be working because tapirs are relatively unchanged for the last 20 million years, give or take a few million. Tapirs are fast. They can run up to 30 miles per hour, even through the underbrush. Hand in hand with their speed, their hide is immensely thick: 1⁄2 to 1 1⁄2 inches thick. Running through the Brazilian rainforest, they can break through branches three to four inches thick. Tapirs are also equally comfortable escaping over land as into water. They are avid swimmers. Their prehensile snout allows them to lay low in the water, breathing through their nose like a snorkel. But they lead solitary lives. One tapir has a range of one square mile. Friends and family can come for a visit, but only newborns and mates are welcome to stay for a few years. And of course, due to human factors, their numbers continue to dwindle. Just as deer can be hit by a car here in Washington, Brazilian drivers must beware of tapir crossings. Again similar to our deer, tapirs are hunted for their meat and hides. Industrialization and cattle ranches are also eating into the territory tapirs can inhabit. Ranchers often fear the tapirs will be competition with their cattle and chase off or kill the tapirs. Fortunately, some ranchers are learning to cohabitate with these nocturnal beasts. Tapirs don’t need saving just because they are cute though. They are the gardeners of the forest. A large part of their diet includes fruit. They also eat the seeds of the fruit, so when they defecate, they are planting the forest. Tapirs are the main animal distributing seeds through the forest. Without tapirs, there could be greater repercussions to the Brazilian rain forest than we could ever imagine. These brawny contemporaries of Equus, the original horse, have survived a long time and wedged out a niche in their ecosystem. With a little care on our part, and given a little lee-way, they could live another 30 million years.